With 2014 upon us (If we’re not already in it by the time this is posted! ), a new riding season will soon follow given that California’s off-season for riding is actually really short. As it is, we’re having an uncharacteristically warm winter season, making the off-season feel anything but. With the start of every new year though – and thus a new riding season – a new crop of beginner riders come en masse, looking for the best motorcycle as their first bike. If you frequent any motorcycling forum, it’s around this time of the year when a slew of discussions are started by new riders asking whether this bike or that bike would make a good beginner bike for them. The usual litany of responses from seasoned riders typically point to small-displacement, entry-level motorcycles. More often than not, it’s one particular small-displacement, entry-level motorcycle – the Kawasaki EX250. So if the EX250 is the quintessential ideal beginner bike, is it then the best beginner bike? 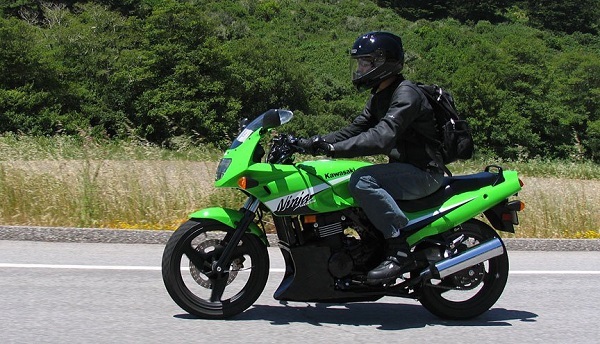 Circa 2006, me on my first bike – a Kawasaki EX500. I’ve never ridden an EX250 myself, having started out on its big brother the EX500 when I first took up motorcycling in 2006. I’ll admit that there was a bit of superficiality in my decision to skip the EX250 – that bike (at the time) just did not look “sporty” enough for me. The EX500 looked only slightly sportier than the EX250, but it at least offered more in the spec sheet, though it was never intimidating or overwhelming. That being said, I still had my first crash ever on that bike within my first month of ownership. Though I had taken the MSF riding course and had been riding non-stop since the course and up to my crash, nothing ever really accounts for hubris, which was really the cause of my crash. I thought I had it all figured out in such a short amount of time, that I was riding my motorcycle with the pretense that I really knew how to ride it. I was writing checks that my bank of skills was not ready for, and so one of the checks finally bounced. Would I have been safer or had been more humble on an EX250? I personally have seen beginner riders starting out on EX250’s and the like crash in the very same rides I do. I even know of seasoned riders – much more seasoned than I am for that matter – go down on smaller bikes because of over-confidence. Worse, I even know of a very well-respected rider – a teacher of this sport and a man I’ve personally come to respect myself – lose his life from an isolated accident on his EX250 during a regular ride he’s done hundreds of times before, on a road he’s logged thousands of miles in. He was the same guy who championed the practicality of small-displacement motorcycles over large-capacity, high-performance sportbikes, especially for street riding. So can the bike really affect the results of any given circumstances resulting from actions not of the motorcycle’s doing? If they had been on even smaller displacement motorcycles, could things have turned out differently for them? A motorcycle – any motorcycle – is merely an extension of the rider. A motorcycle is nothing on its own, and just like any tool, it is without use without a user. So what then, would make an ideal beginner motorcycle? What is the best beginner motorcycle? I’ve attempted to find out once and for all, which I will share in my next entry.